12/05/18 For the establishment of an Animal protection inspection! 12/26/17 Stop the Firecracker Terror! 12/01/17 March for Animal Rights! 07/14/17 Invitation to the 10th ZegeVege festival! 03/09/17 Plastic Bags won't be Free! 08/31/16 ZeGeVege 2016 is here! 05/11/15 None Should Be Free! 02/09/15 No to Fireworks and Firearms! 01/16/15 Let Firecrackers Become History! 05/27/14 The Rescued Animals Need Help! 05/21/14 People of Gunja: Rescue Our Animals! 05/19/14 Save the Animals in the Floods! 01/22/14 Animal Welfare at the European Elections! 12/20/12 Let's Give Anima as Gift! 11/09/12 Animal Friends Needs Your Help! 10/19/12 How to Help Animals? 12/29/11 Life Saving New Year's Resolutions! 09/16/08 Goodbye to Plastic Bags! 06/19/08 Austria Violates Human Rights? 07/16/06 Give the Horses a Life, Not New Wounds and Death! 1. We are witnessing a great increase in the number of vegans and vegetarians. As an organization which, among other things, promotes veganism, do you think that there is a greater need for vegan products on the market? Veganism is no longer a trend. Owing to the way of life that includes excess sitting, more and more people are cutting down on meat and instead introduce vegan or vegetarian meals. I would say that being a vegan was until recently almost a way of life, but today it means that you care about your health. Vegans are very active shoppers; informed, interested, and easy to communicate with. Yes, I would say exactly that, that we "communicate" with them. 2. What products from your Veggie Spar selection have you noticed are in biggest demand among shoppers? Although spreads and drinks are the top sellers, the sale of all other products from the Veggie line have increased consistently. For example, frankfurters and sausages are new products, and they’ve been selling excellently from day one. 3. Among your products, you have a wide selection of vegan ice cream. Have you been planning on introducing vegan cheese and expanding your selection? We are constantly working on expanding our assortment of vegan products. Three and a half years ago, we had 19 products in the Veggie line. Today we already have about 60, which means that the line is constantly expanding. Apart from the Veggie line, there are also vegan products in a new line called Veggie by Neni. Also, if we include products from other manufacturers, it's safe to say that we have about a hundred products in our assortment. 4. What are your expectations from this year's ZeGeVege festival? ZeGeVege is getting more interesting with each passing year. 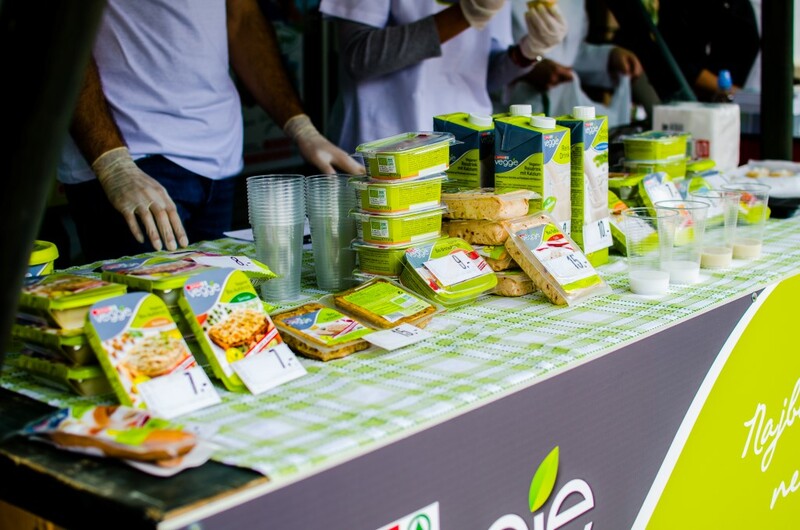 For the third year in a row, we have been a general sponsor of the festival, and we believe that there is no better opportunity for interested citizens of Zagreb who have specific, and I would say, refined dietary habits, to acquaint themselves with our products directly. To us, ZeGeVege is an opportunity to hear what the shoppers want, what they think is missing from our assortment, what they want to see on our shelves and ultimately what they want to buy. 5. If you had to choose, which products from your ZeGeVege offer would you recommend to visitors? I always choose pastries, and I'm very happy I finally have gummies. In these days of summer, I especially recommend our vegan products such as grilled seitan. I tried that too, and I'm glad that we have broken down the prejudice that grill is for meat only. However, this year we have also prepared something entirely new -- the new brand Veggie by Neni. Together with her four sons, Haye Molcho (of Israeli origin) brought us the flavours of the Orient in her Neni products. Scents and flavours from her products put us in the mind of an exotic journey. We used this year's ZeGeVege to test another new brand of vegan products, called Veganz. Until now no one has done it this way, but we are certain that this festival is a perfect opportunity for us to see just how many people will like the Veganz products. Based on that, we’ll decide whether we’ll collaborate with them or not.